We're so accustomed in the Western nations to using spices like black pepper, ginger, nutmeg and cinnamon that we forget they weren't always part of our daily lives. But in fact, their use is relatively recent. Black pepper was the earliest of the ancient spices to be traded, making its way from India to the Middle East in very ancient times. It was grown on the Malabar coast of India (now Kerala) as early as 2000-1400 BCE. Although it's used almost exclusively to flavor food now, its earliest use was medicinal. It was prized for treating constipation, earache, heart disease, indigestion, insect bites, joint pain, liver problems, oral abscesses and tooth decay, and many others. It was so prized, in fact, that it was one of the few medicinals that early Buddhist monks were permitted to carry. It was said to increase stamina on long journeys, and to increase mental acuity. 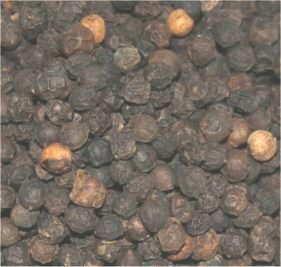 Pepper was so valuable that unscrupulous importers sometimes mixed in juniper berries, mustard seed husks and even ground charcoal to stretch the amount. In 1875, English law imposed severe penalties for selling adulterated pepper. Today, pepper is cultivated across Asia, and accounts for one-quarter of the world's trade. The most prized of the pepper varieties, Malabar, is still grown primarily in India. Black, white and green peppercorns all come from the same plant. Black pepper is created from the unripe fruit, which is cooked briefly and then allowed to dry in the sun (or by machine) until the skin shrinks and turns black or dark brown. To make white pepper, the dark skin of the pepper fruit is removed. This is usually accomplished by soaking the fully ripe pepper berries in water for about a week (a process called retting), during which the outer layers of the pepper fruit soften and decompose. They are removed by rubbing, and the seed is then dried. Green peppercorns also come from the unripened fruit of piper nigrum, but they are not cooked and dried like black peppercorns. They are more susceptible to spoilage, and thus are often freeze-dried or sold in brine. Cinnamon comes from the bark of a tropical tree. There are many varieties, all of whose names begin with Cinnamomum, but only four varieties are commonly sold as cinnamon. C. camphora is sold under the name camphor, but is actually a variety of cinnamon, though it is not used in cooking. The cinnamon most of us in the US are accustomed to is either cassia or Korintje. Both are sold in supermarkets as simply Cinnamon. Both have a spicy aroma and taste. Korintje also has a relatively high level of coumarin, a plant-based anticoagulant. Cassia has a lower, but still significant, percentage. All varieties of cinnamon have some coumarin, but Ceylon cinnamon has the least, such a tiny amount as to be irrelevant even in daily use. In looking for authoritative information on coumarin percentages, I found wildly differing amounts reported for different varieties, and in fact, some conflict as to which varieties are actually being sold as cinnamon. But there seems to be no argument over the fact that Ceylon cinnamon has the least amount, and it is the only one we sell. Ceylon cinnamon has a sweet fresh fragrance, and a clean complex taste. It never overwhelms a recipe, whether you add it to a curry or a dessert, but adds a subtle spark to the other ingredients. Ginger is one of the most widely cultivated spices today, but it wasn't well known in the Western world until the 11th century. It was traded in ancient Rome, but when the Roman Empire fell, knowledge of ginger was lost. Like its cousin turmeric, ginger once grew wild across southeast Asia. Now ginger is cultivated throughout the tropical regions of the world. Like turmeric also, it is the rhizome portion (the swollen base of the stalk) that is used. Ginger is more fibrous than turmeric and has a much spicier taste and aroma, but the plants are quite similar in their habits of growth and their flowers. To those of us familiar with ginger only in the form of gingerbread, ginger snaps and ginger ale, it may come as a surprise to learn that ginger was once recommended as an aphrodisiac. It is well known to Western herbalism now as a digestive aid and a soother of distressed stomachs. It's a potent anti-inflammatory as well, and has been the subject of much recent study (see the Resources section). Ginger is easy to grow at home, though it must be brought inside during the cold months if you live outside the tropics. If you prefer to use it fresh, you can harvest it before it fully matures, at about five months. It will be much less fibrous at that point, and easier to slice or chop. It also makes a better candied or pickled ginger at that younger stage. If you want to dehydrate and powder it, let it grow a bit longer, as much as nine months. The oil content, which provides the pungent aroma and taste, increases as it matures. Turmeric is possibly the oldest of the cultivated spices. Its known, written history dates back at least 4000 years. It was known to the Western world by at least 1280. But it was already in widespread use far earlier across Asia. Its earliest use may have been as a dye, and it still enjoys widespread use for that purpose, both for personal decoration and in religious ceremonies. But it's best known now as both a culinary spice and for its medicinal qualities. Turmeric has been the subject of over 3000 trials and investigative studies around the world. (See the Resources section for some citations). More than 100 active compounds have been isolated from turmeric--curcuminoids, volatile oils, sesquiterpenes and polysaccharides. In traditional medicine, both Ayurveda and Chinese, turmeric has been used for arthritis, gastric upsets, wound healing, asthma, sinusitis and many other conditions. It has been studied widely for its efficacy against breast and colon cancer, and is being investigated now in at least 30 trials in the United States, with others in the UK, India and Japan. Fresh raw turmeric can be sliced or chopped to add to cooked dishes. Raw turmeric is poorly digested,	however. The widely published recipes for "turmeric tea" or "turmeric smoothies" may taste good, but won't provide much benefit. If you choose to purchase raw turmeric root, remember that it needs to be cooked. 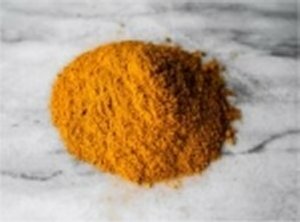 Turmeric is most widely used in powder form. Turmeric is harvested only once a year, and in tropical countries does not keep well until the next harvest. So it has been traditional to cook, sun-dry and powder it for longterm storage. Extended families would gather once a year to share the work, and divide the results of their labor. Nowadays, this processing is most often done in large facilities with controlled temperature ovens for drying. Our company supports and encourages the use of Golden Paste, a mixture of turmeric, a non-inflammatory oil, and freshly ground black pepper. This mixture was perfected by Dr. Doug English, an Australian veterinarian, after years of trials in his practice and on family and friends. 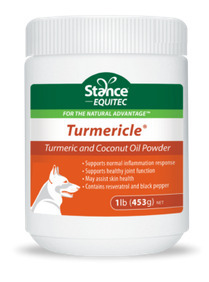 To learn more about its use, you may want to check out the Turmeric User Group on Facebook. Our product detail page also has information on using Golden Paste.